opt = sbioncaoptions returns an NCA options object. Use dot notation to set the object properties for the options. Options to calculate NCA parameters, returned as an NCA options object. The properties of the object are classified into two groups, data classification options and parameter calculation options. IVDoseColumnName Name of the data column that contains the IV dose amount. EVDoseColumnName Name of the data column that contains the extravascular (EV) dose amount. concentrationColumnName Name of the data column that contains the measured concentrations. timeColumnName Name of the data column that contains the time points. Name of the data column that contains the grouping information. You can specify grouping using two levels of hierarchy. Specify the outer level of grouping in this column. Specify the inner level of grouping (subgroups) in idColumnName. If you specify idColumnName, then you must also specify groupColumnName. For example, consider data that contains three groups, where each group contains four patients. The group column labels the three groups, and the ID column labels each patient. Name of the data column that contains the grouping information. You can specify grouping using two levels of hierarchy. Specify the inner level of grouping (subgroups) in this column. Specify the outer level of grouping in groupColumnName. infusionRateColumnName Name of the data column that contains the infusion rates. LOQ Lower limit of quantization, a threshold below which the values of dependent variable are truncated to zero. AdministrationRoute Drug administration route. Three types of administration are supported: IVBolus, IVInfusion, and ExtraVascular. TAU Dosing interval for multiple-dosing data. 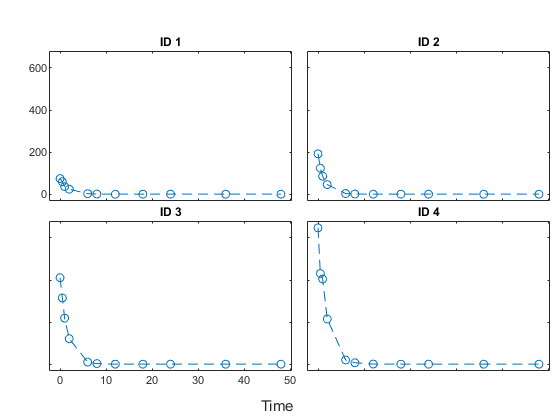 SparseData Boolean that indicates whether or not the values of dependent variable are averaged between subgroups to further populate a profile for a group. Time values for each measurement across subgroups (IDs) within a group must be identical. Two-element row vector that specifies a custom time range to compute the terminal rate constant (Lambda_z). The time range applies to all groups; you cannot specify a different time range for each group. For details, see Noncompartmental Analysis. Cell array of one or more two-element row vectors that specify one or more time ranges used to compute the partial AUC values. You can specify multiple rows for group-specific ranges, where the number of rows equal the number of groups. If there is only one row, the same time ranges are used for all groups. Cell array of one or more two-element row vectors that specify one or more time ranges used to report the T_max,C_max pairs within the specified ranges. You can specify multiple rows for group-specific ranges, where the number of rows equal the number of groups. If there is only one row, the same time ranges are used for all groups.